Happy Holidays everyone! I hope everyone had a merry Christmas and is looking forward to 2012. Today I am announcing the discontinument of "What's That? Nerf." I learned a lot since I started blogging in May. One fact that has struck me was that I no longer have the time to run a blog that people like you want to read. School has been very demanding and so something has to get kicked out of my schedule. I still love Nerf, yet having premier coverage of the toy weapon world is quite difficult. Support from my friends about Nerf has been diminishing also. All these factors have lead me to this decision. I would have to say Nerf is getting better by the day and I hope that when I'm much older, my children will have as much fun as I did with Nerf. I need to thank all of you readers- the ones who commented, voted in polls, ect. You know where to go to find the best of Nerf....so go right ahead. "What's That?Nerf" is officially closing up shop. Lets play catch-up! Rumor edition. No info about these blasters in stores, yet. Go ahead and read those- they're well-written- as usual. Quite an amount of posts coming...so hold you horses. Nerf has now been coming out with Nerf-themed gear. Here's a recap. All of these are being made by Sakar. Note: These are all in addition to Nerf gear sold now (DS Armor, Earbuds, ect.). More info as some of this is found in stores. Urban Taggers got their hands on a Rayven early- no longer is this a rumor! Head over to their blog for all the stats. All my info from this post was confirmed! *This poll ran a little long, I know. I apologize. Every two weeks there should be a new poll. *This "month's" poll question was...What is your favorite Nerf line? A big thank you to all who voted. I appreciate your readership and input. Look on the right sidebar and vote for the 2nd half of October's Nerf poll- Which new blasters are you most likley to buy? SgNerf got his hands on a Speedswarm early- no longer is this a rumor! Go to his blog for all the details! All our details were right from this post. ﻿ So what do you think? 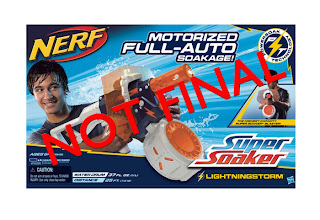 Is Nerf making to many repaints? I think so. They should spend more time on new blasters, not new plastic. Here's the post of the blaster leak itself. Interesting- but kinda ugly in my opinion. As Nerf said yesterday, they would be giving info on a NEW blaster today. They announced something alright, but its not a new blaster. Nerf talked about Barricade repaint. Its another Transformers skin, this one yellow. (Bumblebee) It was also in a leaked photo. Really? I wanted to see the Dart Tag gun! How are everyone else's feelings on this issue? SgNerf, a Nerf blogger in Singapore, has spotted a 18 dart drum being sold in individual packs. Usually, the only way to get the drum is to buy the Target exclusive Alpha Trooper CS-18. Jesse, a reader of Urban Taggers, reported that they are already in stock in Idaho. Its selling for $14.99 in the Kmart there. Many people have been looking for Nerf to do something like this and now its here. Will 35 dart drums be next? This blog, What's That? Nerf is now 100 days old. Its took a lot of hard work and some foam to put it all together. I've posted 9 videos as dougaschu, wrote 48 posts, and tweeted 23 times. Also, you guys have left 2 comments and 305 pageviews from all around the world! I wasn't sure if I'd make it this far. Now I feel as if the blog is finally starting up. Keep reading and spread word. So, I've creating a giveaway for your readership. Its simple: Comment on this post, send me a tweet, or message me on Youtube telling me why you like my blog. On Saturday, yes- Vortex Day, I will draw a winner randomly. Only one entry per person will be counted. The prize will be...WAIT, I can't tell you the prize! It will be fairly small, but remember I don't get paid for this. Nerf is just a hobby and so is technology. Put them together and... out comes my blog. We'll sort out the details with the winner later. Nerf's newest action sport, Dart Tag, reopened in March 2011 with the release of 4 new blasters. The Speedload 6 is one of them, featuring an internal 6-dart clip, positive ranges, and slam fire. Its a complete package. I've now noticed that Walmart.com has the Vortex refill pack, Vortex 10-disc magazine, and the new Dart Tag darts in 16 and 36 packs. The Vortex packs say that they can not be found in stock, so you have to go to the store to see if they are there. As for that Speedload 6 review in video and text, the written one will be the only one done today. The video will have to wait until Sunday evening or Monday. For doing that Nerfmobile thing for my sister, Alainea, she got me a Speedload 6. It arrived-Thursday- and so I've been playing with it and making reviews. Running this blog durring the week will be harder than I thought... I should have those up before I leave this afternoon. Vortex is getting closer, next Saturday is the big day. As September 1st is just hours away, I'd like you all to know that its been a lot of fun working on this blog this summer. No, I'm not leaving or discontinuing the blog. (More readers would be nice, though. )I might get some of my friends to start authoring here, actually. Its just that with school taking up 90% of my day, the blog won't get as much action as in August. (37 posts?!?) Content will get posted, but just not as fast. I'm aiming for 5 posts a week. Vortex Day, 9/10/111, is quickly approaching. Nerf's Facebook Page still has the countdown, and I captured a really neat pic of it today. Can't wait. Also, this blog has been running since May 30th. 3 months! I'm planning on doing something for the 100th day. I've now placed my order for that Dart Tag Speedload 6 I earned for doing that Nerfmobile stuff for my sister, Alainea. See that video 9/1/2011. Walmart has a great price for $10 and free shipping to home. It should arrive between 9/1/2011 and 9/8/2011. Reviews (written and video) will come as soon as I can make it. By then Vortex will be days away! Wow! My sister, Alainea, has created something called the Nerfmobile. Here's a teaser trailer for the real video, coming 9/1/2011. The video has supposed to have music, but Youtube just keeps processing the AudioSwap. Its part funny, part showing her work. She has agreed to buy me a Speedload 6 for all my help, so watch for that review. I should have both the written and a video. I've had the "My Amory" page up on my blog for a few weeks, but now I got around to making a video about it. I'm hoping to get a Speedload 6, some of the new Dart Tag darts, a Vortex Proton, and some Vortex discs this month. I finally got around to doing that range test of all my blasters as I've said before. The test is not that accurate- but gives you a general idea. In the future, I'll do multiple shots and averages and the whole 9 yards. For now, you can watch the tests. I explain how the darts skid. I tried to shoot all blasters flat and with their specified dart (ie: What Hasbro puts on the box). Sorry that the video is not better but I'm so tired and busy today that this is all I could do. 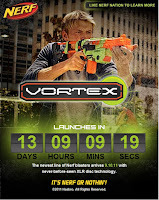 Nerf's Facebook Page now has up a countdown to Vortex- less than 14 days. That's a long wait- get here already! I'm taking a short vacation Monday Evening until Friday night to Las Vegas and the Grand Canyon. (If you can offer any help to my fear of flying, please do tell me.) My family has a LONG story on the vacation planning from pop-up ads to snowstorm surprises. If I ever have a huge break on Nerf news, I'll get around to tell it. Anyway, I'll have an Internet connection most of the time, even on the plane, to respond to comments and Tweet, but no blogging here unless there is a major Nerf emergency. My little sister was watching Big Time Rush, a teen-singing group show, on Nick yesterday and she called me to the TV because they were using Nerf guns. Of course, I was late but she said she recognized a Nerf and Buzz Bee gun. So today, I watched it (the show is so annoying) just to see if she was joking, but then they pulled out the blasters and started shooting. Here's a pic I captured: That's a Barricade RV-10 and other guy had a Buzz Bee Tommy 20. Some little kids are shooting a Raider CS-35, a Magstrike, and a Buzz Bee Tommy 20. Whenever other shows have blasters, they are usually painted so that they are almost unrecognizable. Maybe Nick is just to lazy... Also, I found out the the stars of the show love Nerf guns and play with them all the time. I've talked about 3 of the Vortex blasters at Walmart, but now I'm wondering, where's the Proton? So I contacted Walmart on this matter, and they have no clue about if the Proton will available. Nothing. 1. 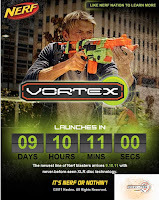 Shopko will have all the Vortex products on 9/10/11. 2. The Vortex blasters will be featured in that weeks circulatory. On a side note: Shopko has great costumer service. They responded to our emails within minutes. During the heat of a Nerf battle, have you ever had you gun horribly jam? When that happens, try throwing darts. Now some people may not allow you to do this at Nerf wars, but if you can, here's how. Grab the dart with your thumb and middle finders near the tip of the dart. Then place your pointer/index finger on the hole on the back of the dart. Lunge forward like you are throwing a baseball and push with your pointer/index finger. become improved. For any time your blasters fails, try throwing darts. 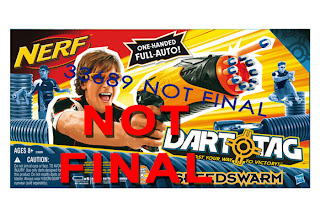 Kmart.com now has all six of the Nerf Vortex line products on their website! Right now the Nitron is ready to preorder but the rest say that they are "out of stock" but will arrive shortly. Some of the products are slightly overpriced, but lower than TRU. The site indicates that they are available at some Kmart stores, but not mine. This is the first time I've seen the refill pack for sale anywhere. Also, the picture of the Vigilion is wrong. It shows a picture of the Proton. Oh, well. Mistakes happen. I don't do much modding myself and much rather like to admire other's work. I was watching Drac's review on the Max Force Crossbow-65 when I was inspired to make a Nitefinder shoot the same(ish) way. This mod is also like a mini Big Bad Bow that shoots darts. First, make sure the blaster is deprimed. Then place one end of the rubberbands under the barrel and place the other end around the lip on the front to the priming handle. Ta-da! You now have a Nitefinder that shoots 5-10 feet farther. Combined with other mods, you may be able to really blast away the competition. Note: After long use, there is the potential that this mod can ruin your blaster, like all other mods. I'm trying to make a logo for my blog because I feel like my blog needs some individuality and identification. So, I quick made up one prototype for you to look at- it'll need more work but its a start. More will be to come. So tell me if you like it or don't- comment below. Walmart now has two different Nerf promo videos on their site- one for the Whiteout series and one for Vortex line. While reading my email today, I came across this week's Walmart e-mail newsletter. Nerf has a small feature block and Nerf is also called a "hot summer essential." Awesome! 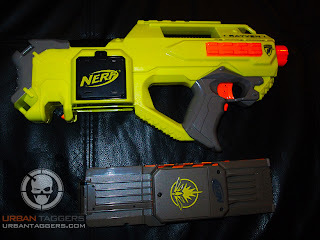 For many years, different stores have had exclusive Nerf blaster repaints. Early on, Walmart sold Longshots and Recons in red. Target used to have the Clear Series with red darts. Toys R Us has the Sonic Series. After years of drought, Walmart gets a new exclusive series- Whiteout! This blaster series (aka repaints) has a white base coat with blue, orange, and gray detailing. These look very cool and earn a spot in a collectors collection. Walmart currently has the Maverick, Longstrike, and Deploy on their website. The Nitefinder should be coming soon. Other Nerfers have spotted Whiteout Whistler and Streamline darts at Walmart. How are everyone doing today! After a week of away from Nerf, I had 70 Nerf blog posts to read. Wow! I've seen that a lot has happened in the Nerf world, and multiple posts should be up in the next 24 hours catching my blog up. Until then, happy Nerfing! 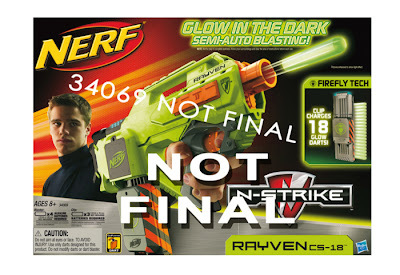 Nerf N-Strike Spectre REV-5 is a Nerf gun that came out in 2010 in the store exclusive series. You will only find it at Walmart. 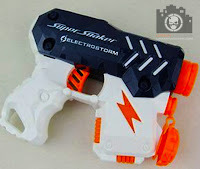 The blaster is seen as an improvement from the good ol' Maverick REV-6. Is it? Find out below.